Mitchell Levy, @HappyAbout, is The AHA Guy & CEO at AHAthat who empowers thought leaders to share their genius. Eran Levy (http://aha.pub/EranLevy) is the Executive Director of Connected Futures (https://connectedfutures.cisco.com/bio/eran-levy/) and the head of Cisco’s C-Suite Thought Leadership group. Teresa de Grosbois @TeresaDee is the Chair of the Evolutionary Business Council (https://ebcouncil.com/) and an international speaker sought by entrepreneurs and large corporations wanting to better understand how local gossip can suddenly turn into epidemic word of mouth. Robert Clancy @GuideToSoul is the bestselling author of the book, “Soul Cyphers,” and a co-founder and managing partner of Spiral Design (https://www.spiraldesign.com/), a graphic design and web development firm that specializes in taking corporate brands, marketing campaigns, and website design from ordinary to extraordinary. Swami Sadashiva Tirtha @MonkMedium, a.k.a. The Orange Cowboy (http://orangecowboy.com), is a born shaman and healer whose life calling is to share light, love, and joy with people around the world. Thanks for agreeing to support this program during the EBC retreat. We have discounted the Kindle book price to 99¢. We so appreciate your support spreading the word. You can share on facebook, twitter, LinkeIn, G+ as well as email, post and mention this book in your newsletter. Sample copy is provided for all of these platforms. It would great to get a review on Amazon. Click the Review and Excerpts tabs to see examples and to review content. If you have other ideas for sharing this book going forward, happy to be on radio and TV, please reach out to me directly. Swipe copy is provide for your convenience to tweak to your own voice. Just click the appropriate tab above for the copy you need. 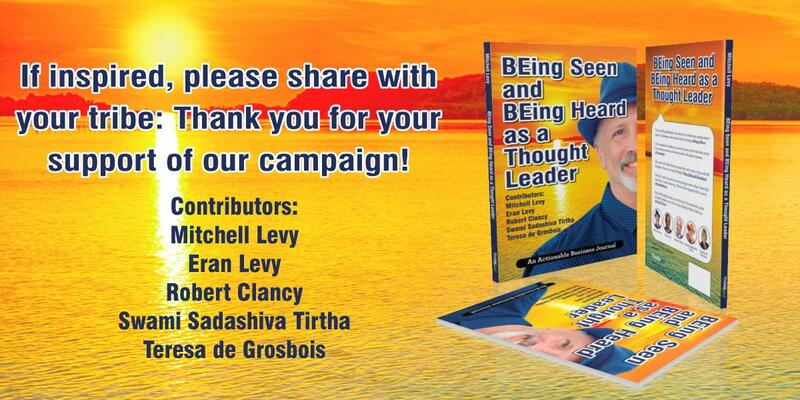 Thank you again for your help in making this book a huge success!